Wireless DMX 512 simply replaces DMX 512 cables in a lighting system. Instead, the data from the controller goes into a DMX connector on a wireless transmitter, and the data moves wirelessly through the air. 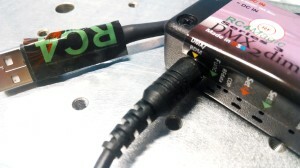 A receiver picks up that data and reproduces it on a DMX connector. For the user, it works just like a cable, but without the wire. Good quality wireless DMX is carefully engineered to avoid delays in the process of transmitting and receiving, and not suffer dropouts that might be caused by other wireless technology in the vicinity. The top four wireless DMX systems do this so well that the reliability of the wireless connections surpasses the reliability of the wired connections for some metrics; the likelihood of channel jumping or ghosting is much lower for wireless than for wired, because the original DMX protocol from 1986 does not provide error detection or correction. All reputable wireless DMX systems use sophisticated methods to avoid and eliminate data errors. Who can use wireless DMX? Wireless DMX is ideal for individuals using wired DMX equipment who would like to get rid of cables, or avoid having to install them. In theatre, it is used, along with wireless dimming, to get DMX data to mobile set pieces and small props. It can also be used to move data from the main DMX controller to fixtures up on a pipe, or in a dimmer rack, or anywhere else. In motion picture production, wireless DMX is used to control lighting inside vehicles, on building rooftops, and much more. Churches, museums and architectural restorations can use wireless DMX to easily add new lighting to existing facilities, without needed to break walls to run cables. DJs can eliminate unsightly cables running along the floor and around doorways by using wireless DMX to control lighting trees, cop-lights, fog machines, and special effects. In large arena and stadium productions, from music shows to cirque performances to sports half-time shows, wireless DMX is used to reduce setup times by eliminating the need to feed cables and then reel them back in. Wireless DMX can also be used in costumes and in specialty items like LED infused microphones and guitars. How hard is it to use wireless DMX? It’s not. Wireless DMX replaces cables, is quick and easy to use, and is reliable for significant distances. Wireless DMX users need to be aware of other wireless systems in use, and if their system is interfering with other systems. They also need to think about DMX security, and take steps to make sure their system can’t be hacked. RC4’s System IDs eliminate that concern. The venue itself is another concern. The technology needed in a stadium or arena is different that the ideal technology for a black-box theatre. Do end users need any special skills to work with wireless DMX? The best wireless DMX systems, regardless of the target market and the application, are plug-and-play. Some require one or two simple button presses to pair receivers with transmitters. Others work right out of the box with no need to touch anything at all. Where can I learn more about working with wireless DMX? RC4 Wireless has been making the world’s most popular low-voltage wireless dimmers since 1991. Today, RC4 Series 3 Harmonized Design offers the first and only cross-platform wireless dimmer design that is compatible with all leading wireless DMX data protocols worldwide: RC4Magic, Lumen Radio CRMX, and Wireless Solution W-DMX. With only minor hardware differences between models, and a nearly identical user-interface across all RC4 Series 3 devices, a new standard is set for ease-of-use and range of features. Review the rest of the subcategories in this menu — RC4 Features — to discover all the reasons why RC4 Wireless DMX and Dimming has been a top award winner time and time again. From easy configuration, to unparalleled color control, to outstanding built-in special effects, RC4 Series 3 devices are truly peerless. With RC4 Series 3 Harmonized Design, you’ll know how to operate our dimmers no matter what wireless protocol is on the job when you arrive. Every feature that is built into our RC4Magic Series 3 system is now included in all RC4 Series 3 LumenDim and Series 3 W-DIM devices. For advanced applications, extensive wireless RDM features are provided in RC4 Series 3 LumenDim devices for use with LumenRadio CRMX. Those same features are optionally available for W-DIM devices working with RDM-capable Wireless Solution W-DMX transmitters. 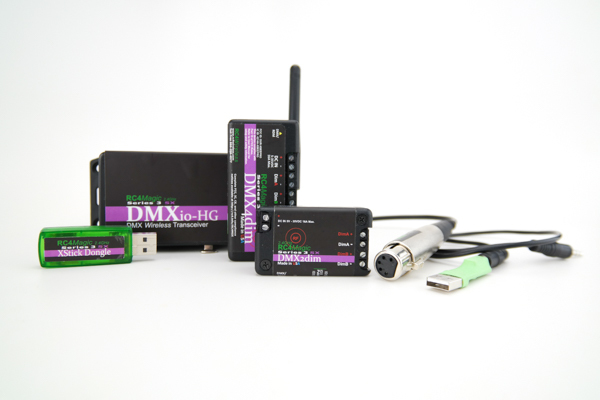 Finally, wired DMX and RDM work with every Series 3 device, across all platforms. A handful of Wireless DMX systems will operate in the 5.8Mhz band, from 5.725GHz to 5.875GHz. 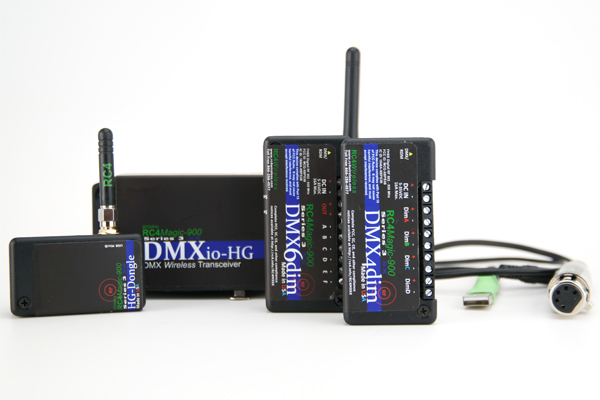 Only one Wireless DMX system — RC4Magic-900 from RC4 Wireless — operates in the 900MHz band, from 902MHz to 928MHz. It made it’s flawless debut controlling exterior lighting for Super Bowl XLIX, possibly the most mission-critical application of Wireless DMX on earth. All of these frequency ranges are referred to as ISM (Industrial/Scientific/Medical) bands . This may sound specific and specialized, but “Industrial” includes a huge and ever growing range of consumer products from myriad manufacturers used all over the world. All else being equal (RF power, antenna gain, etc.) lower frequencies propagate better than higher frequencies. Thus, range is better, and signals pass through objects more readily at lower frequencies. In just about ever humanly perceivable way, lower frequencies work better. Don’t take our word for it: here’s the math, outlined by a reputable third-party. The 2.4GHz band is the lowest band that is internationally harmonized — it can be used in just about any country. This makes it the first choice for almost all commercial products. When a company develops RF technology, they want the highest possible return on investment, and that means they want marketability in as many places as possible. Microwave ovens operate at 2.45GHz, the resonant frequency of water molecules. This frequency of electromagnetic energy causes water molecules to vibrate, resulting in friction between them, which generates heat. This is how microwave cooking works. The important point here is that 2.4GHz radio transmissions are quickly absorbed by water and by objects containing water — including animals and people — and converted to heat. When that happens, the signal is gone. In general terms, the 2.4GHz band provides a total of 100MHz of bandwidth. The 5.8GHz band provides 150MHz of bandwidth. The much lower 900MHz band is smaller and provides only 26MHz of bandwidth. Because of how things have worked out with regulatory agencies, there is more room as the higher frequencies. Even so, the carefully designed RC4Magic-900 system supports four simultaneous full-spec DMX universes at 900MHz in any one location. With just a few hundred feet of physical separation, many more systems can be operated nearby. The 900MHz band can only be used in The United States, Canada, Brazil, Singapore, and Australia. Because this is the most limited of all the bands, it is used far less than the others. It is less congested, from an RF perspective, and we expect it will remain that way. Taking all of this into account, if you are working in The United States, Canada, Brazil, Singapore, or Australia, and do not expect to take your Wireless DMX equipment outside of these areas, then RC4Magic-900 in the 900MHz band is a great choice. Otherwise, RC4Magic Series 3 in the 2.4GHz band is preferred. If you are operating in an area where 900MHz is not available, or you might sometimes need to travel into those areas, the next best choice is the 2.4GHz band. Since this band is heavily congested worldwide and becomes more so everyday, it is important to choose an RF technology that is least susceptible to interference and least likely to cause interference for others. Keep in mind that “others” includes any and all wireless technology in your production, not just strangers outside. RC4Magic at 2.4GHz uses Direct Sequence Spread Spectrum (DSSS), rather than more common Frequency Hopping Spread Spectrum (FHSS). This is because DSSS delivers the best possible performance in a crowded RF space. The 5.8GHz is not ideal for Wireless DMX applications for various reasons, but is sometimes deployed as a back-up band for systems primarily operating at 2.4GHz. Higher frequency means poorer propagation and range. RC4 Wireless is happy to help you make the right choices. Do not hesitate to contact us. Imagine your wireless DMX careening along in a private, bulletproof limousine on the wireless autobahn, safe from interruptions, dropouts and crashes. An impossible dream? Not at all, thanks to RC4 Wireless System IDs. Just ask Disney, Cirque du Soleil, Blue Man Group, and many others who trust RC4 equipment on their most complex productions throughout the world. System IDs make RC4 Wireless products as safe and reliable as their wired counterparts. The technology behind RC4 System IDs is very similar to that used in data encryption keys. System IDs essentially create a wireless VPN [Virtual Private Network] for each DMX wireless system. Just like VPNs keep your identity safe from hackers, RC4 System IDs keep your wireless DMX data 100% private and safe from other projects and systems, with a robust resistance to signal loss and slow down. While other firms claim to have secure wireless DMX, the security they provide is limited at best. At RC4, every new user or project gets a new set of private ID codes. In the vast majority of cases, codes are assigned to a company; The Seattle Opera has their IDs, the Santa Fe Opera a different set, Milwaukee Repertory Theatre has their own, and on and on. These System IDs provide bulletproof security for wireless signals and keep them safe from unwanted show-stopping interruptions and interactions. When new RCMagic, RC4Magic-900, or RC5 EASS systems are purchased, the owner is assigned three unique Private ID codes. RC4 is the only firm that has unique System IDs; they are assigned in-house and reside in the firm’s secure, comprehensive database of users and their individual devices. RC4 System IDs consist of four characters that can each be a letter or number, i.e 2876, 2F7D or DFAF. Each code is a private, secure ID that will stay with the owner and system for the life. Out of the box, each RC4 wireless DMX device has three Private IDs (ID0, ID1, and ID2) plus one Public ID (ID3). 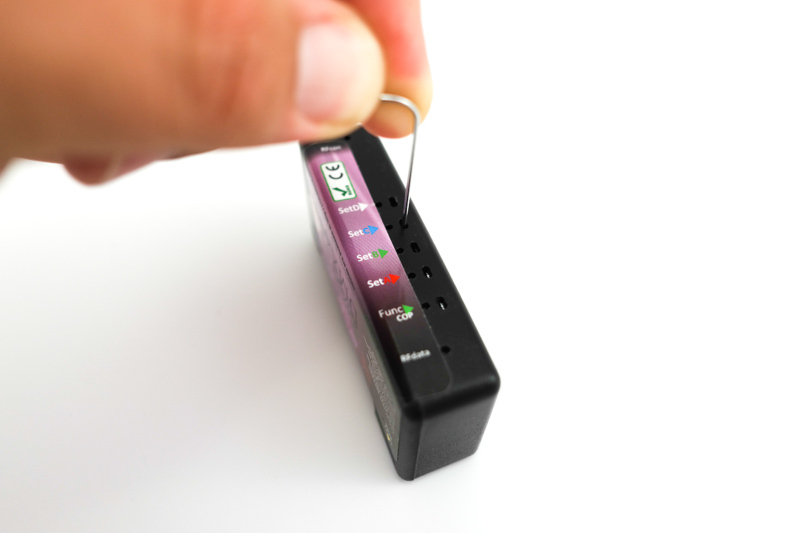 The Private IDs keep the RC4 wireless DMX signal safe from interference. Units on the Private RC4 network can communicate with each other, and all systems can easily be expanded. 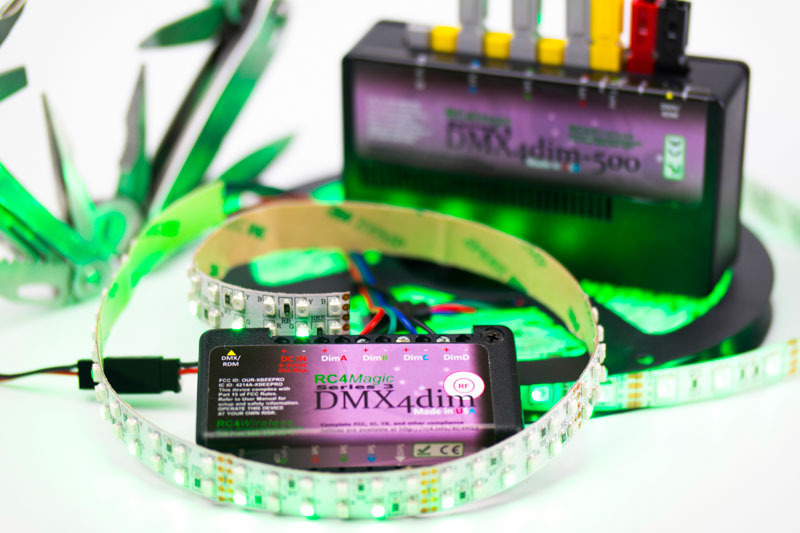 The Public ID allows users of different RC4 wireless DMX systems to combine their gear for large or unusual projects and collaborations; this ID is the same for all RC4 devices. RC4 Wireless System IDs can be selected via the buttons on the device. However, when using RC4 Commander software, the number of Private IDs can be increased exponentially. This enables users in large organizations to customize their systems, while their signal stays uninterrupted and secure, even between many different projects within their own domains. When the objective of a device is to be as small and inconspicuous as possible – to be invisible – the biggest challenge is creation of the user interface. Way back in 1993, RC4 Wireless recognized that wireless dimmers would get smaller and smaller, and a method of setting channels and curves needed to be scalable down to the tiniest sizes. Our OneTouch™ system first appeared on RC3 dimmers (the predecessor of RC4), when the limitations of wireless technology could deliver only 32 channels, and curves were limited to Linear and Non-Dim. Today, RC4 OneTouch™ makes it easy to assign any of 512 DMX channels and any of 4 dimmer curves to any RC4 dimmer with a single press of a single button. No matter how small wireless dimmers become, we will always find a way to provide one pushbutton for each dimmer output. Using RC4 OneTouch™, four different dimmer curves can be selected on most devices: ISL (Inverse Square Law), ISL with RC4 Digital Persistence, Linear, and Non-Dim. Using Remote Device Management (RDM) and/or RC4MagicPC, several additional dimmer curves are available: Inverted ISL, Inverted Linear, Inverted Non-Dim, Servo CW, and Servo CCW, and the 4th curve (normally Non-Dim) can be changed to any other available curve to put the features you need most right at your fingertips. The linear curve is perfect for incandescent (including halogen) lighting – traditional filament bulbs. With this curve, a DMX channel at 50% produces 50% output at the dimmer, which produces 50% lumen output in a lamp filament. 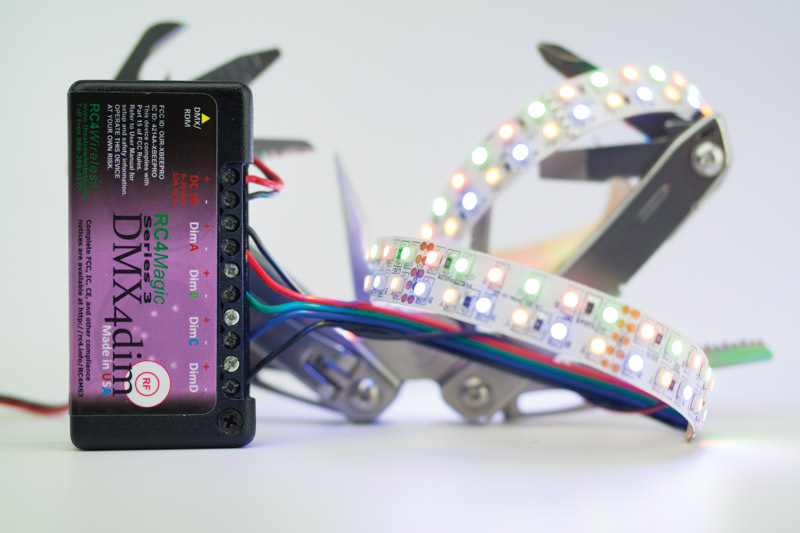 The ISL curve is optimized for light emitting diodes (LEDs). LEDs produce 50% lumen output when dimmer power is reduced to 25% (which is also why LEDs, on average, draw a lot less power than other lighting – small reductions in brightness result in large reductions in power consumption). You must use the ISL curve to make LEDs dim smoothly; do not use the linear curve for LEDs. The Non-Dim curve includes hysteresis to ensure the dimmer output will never dither or oscillate, even if the assigned DMX channel is hovering around 50%. The DMX level must rise above 55% to turn the dimmer fully on; then the level must fall below 45% to turn the dimmer fully off. This is ideal for relays, solenoids, AC inverters, and anything else that needs cleanly switched DC power. Unlike using a traditional SCR-based AC dimmer as a switched AC circuit, the DC output of an RC4 Non-Dim output is absolutely clean DC power, limited only by the power handling rating of the dimmer components. The Servo CW curve runs most hobby servo motors in the clockwise direction. The lowest DMX level produces a 1ms pulse and the highest level produces a 2ms pulse; pulses get longer as the channel level increases. The Servo CCW curve runs hobby servo motors counter-clockwise. The lowest DMX channel level produces a 2ms pulse and the highest channel level produces a 1ms pulse; pulses get shorter as the DMX channel level increases. RC4 Series 3 devices support a wide range of pulse-width-modulation (PWM) frequencies. PWM provides the smoothest LED dimming available, but can cause banding and other artifacts when captured with video recorders. Lower PWM frequencies, down to the low hundreds of Hz, look best to the human eye and are favored for theatrical and other live entertainment applications. 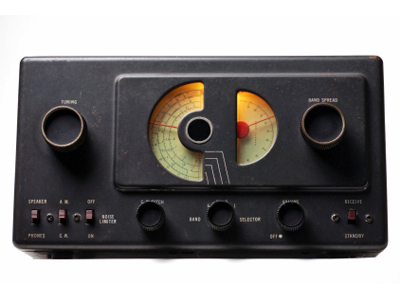 Higher PWM — 5kHz and up — eliminates video artifacts. RC4 Wireless provides the widest range of PWM frequencies available on the market: 77Hz, 615Hz, 1250Hz, 5kHz, 10kHz, 20kHz, and 40kHz. At the top of the range, super-slow-motion (very high frame rate) video is flicker-free. Using common PWM dimming near electrified musical instruments and microphones can result in audible interference. This is because 77Hz, 615Hz, 5kHz, and 10kHz are all audible frequencies, and audio circuitry can be exceptionally sensitive to electromagnetic interference. The solution for this is 20kHz and 40kHz PWM. These very high modulation frequencies deliver lower resolution, not high enough to completely eliminate “steppiness” at the bottom of the ISL curve when dimming LEDs. Nonetheless, this trade-off is entirely acceptable when clean, clear, crisp audio is paramount. The selected frequency will be used whenever an ISL curve is assigned using either RC4MagicPC or RC4 OneTouch™. If you will routinely be using your RC4 Series 3 dimmer with video, leave the PWM frequency at 5kHz. If you are always lighting instruments and microphones, leave it at 20kHz. Be sure to switch back to 615Hz in live performance situations to deliver the best appearance for human observers. The PWM frequency setting is stored and remembered forever until you change it or restore default settings. Factory default is 615Hz. Simply the Best Color Control Available. Color mixing has been a cornerstone of theatrical lighting design from the earliest days of incandescent lamps and gels. Today, LEDs offer even more vivid color while drawing less power, fitting into smaller spaces, and generating almost no heat. The easiest way to mix color using DMX channels is direct control of each primary color with a separate dimmer: a channel for red, another for green, another for blue (RGB). Sometimes it helps to add a fourth channel for white (RGBW to improve light pastel shades) or amber (RGBA to improve differentiation in the orange-yellow range of the visible spectrum). The primary technical disadvantage of direct RGB dimming is difficulty maintaining accurate color while fading three (or more) levels up and down. Even using a subgroup on a sophisticated DMX controller does not ideally solve this problem, because the limited resolution of 256 steps per dimmer causes visible skewing of colors at low levels – there just aren’t enough steps to maintain accurate ratios. Another disadvantage of RGB control relates to human perception of color in design. We don’t think of color as a mix of primaries, we think of robin’s egg blue, hot pink, or lavender. In our mind’s eye we see gel colors, swatch colors, Pantone colors, but rarely do we consider color as ratios of the primaries. Hue (H) controls the mix of primary colors. One channel fades across the visible color spectrum starting at pure red, fading through yellows, to greens, to purples, and back to reds. The very top and very bottom of the range are both red, because the model is a circle, not a line, and the ends are the same point. Saturation (S) controls the depth or brilliance of color. Less saturation adds more equal balance of all primary colors. At minimum saturation, the resulting color is pure white. Less saturated colors are often referred to as pastels. When controlling RGBW light sources, a lower saturation level also increases the white output level. Level (L) is simply overall brightness, solving the technical problem of maintaining a particular mix while fading up and down. RC4 Series 3 dimmers handle color mixing with 16-bit arithmetic – a range of 65,536 steps – enough to keep color mixes looking good, even at the bottom of the dimming curve. A significant advantage of HSL color control is economy of control channels. It is possible to create complex HSL drivers that use many primary color sources – RGBAW, for example. No matter how many source colors are used, HSL only requires three DMX channels for control. When using RC4Magic Series 3 dimmers, RC4MagicPC allows the red-green-blue-white balance to be fine-tuned using RC4 ColorMatch™. This is particularly handy with custom-built props. RC4 HSL Color Control with RC4 ColorMatch. RC4 ColorMatch™ makes it easy to calibrate color between multiple devices by visually matching white color temperature. This allows custom-built props to conform to the color palette of other devices, regardless of the light sources (usually LEDs) used. When using the hue/saturation/level (HSL) color controller in RC4 Series 3 dimmers, variations in LED color becomes apparent. Some may appear warmer, others cooler; some may be too green, lacking enough blue, and so on. Even LED sources that claim to be color-corrected or standardized may produce different color-temperatures of white, and this usually affects the entire color palette. RC4 ColorMatch in RC4Magic Series 3 dimmers provides a simple way to fine-tune color rendering. Each primary color — red, green, blue and, optionally, white — can be scaled, and this adjustment is applied constantly, in real time, ensuring that the desired color palette is smoothly rendered all the way around the HSL color wheel. When building props using primary-color LEDs, it is difficult (often impossible) to match lumen output for each color. And each LED also requires a current-limiting resistor that must be sized appropriately for the voltage used, as well as the LED current draw and forward voltage. The ideal resistor is not always available, and the closest manufactured value must be substituted. The result is often one or more LEDs lighting slightly less brightly. Viewed individually, small variations in brightness between primary-color LEDs is virtually unnoticeable to the human eye. But when color mixing is introduced, our eyes are remarkably sensitive to very small differences in color. RC4 ColorMatch counteracts variations in LEDs, resistors, even mounting and diffusion, bringing the overall color experience back to a pleasing visual standard. The RC4 Wireless Flkr Effects Engine™ is a versatile DMX-controlled tool for creating modulating, dynamic light effects. Such effects are often described as dancing, wavering, flickering, shimmering, strobing, and as fire effects, and candle effects. They are often used in theatre and film for the look of candle light, welding flash, fire in a barrel, simulated electrical faults or failures, the light and shadow cast by a television screen, and much, much more. RC4 Wireless Flkr Effects Engine™. Rather than provide preprogrammed or “canned” flicker effects, the RC4 Wireless Flkr Effects Engine™ provides numerous control channels to build and fine-tune an infinite range of effects that can utilize a wide range of light sources. The primary tools provided by the RC4 Flkr Engine are Low Frequency Oscillators (LFOs), and Random Number Generators (RNGs). These can be used separately, or combined in various ways, to influence the output levels of multiple dimmers. The Low Frequency Oscillator (LFO) generates a triangle wave, sometimes called a saw-tooth wave. It is a signal that steadily rises and falls, over and over again, at speeds ranging from one cycle over several seconds, up to several cycles in a single second. When a simple LFO modulates the brightness of a dimmer over its full range, you will see the dimmer get brighter and brighter, reach its peak at 100%, then get dimmer and dimmer, go completely out at 0%, then come back on and get brighter and brighter, and so on. But it is not necessary to modulate over the full range of a dimmer from 0 to 100% – it is usually more appealing to establish a base level, and use the LFO to gently and subtly animate the look. For a more natural affect, it is sometimes better if the LFO frequency is not absolutely steady. Using a Random Number Generator (RNG) to influence the LFO frequency, the rate of LFO rise and fall can vary over time. As we saw with LFO modulation of brightness, this feature is usually most pleasing when applied subtly, but it can also be used to create very sudden, extreme, and irregular changes in speed. The RC4 Flkr Engine provides one LFO with two outputs: normal, and inverted. When the normal output is rising, the inverted output is falling. They are exactly 180 degrees out of phase; they are compliments of each other. RNGs can also be applied directly to the brightness of dimmers. Unlike the ebb and flow of an LFO, RNGs are quick, crisp, and shimmery. In the RC4 Flkr Engine, a stream of random numbers is generated 32 times faster than the LFO cycles up and down. That is, the LFO frequency also affects the frequency of RNG shimmer, but is a much faster element of the overall look. In many cases, shimmer creates a faster component to the effect than is possible with a DMX console effect, which is limited to 44 frames per second at best and is often slower. Thus, the fastest blink you can create with DMX is 22 cycles per second, since one frame must raise the level, and the next frame must lower it, requiring two frames to create one transition. Consoles that output 30 frames per second — which are quite common — can only produce 15 blinks per second with no capability of subtle variation in speed. The RC4 Flkr Effects Engine removes these limitations entirely and produces noticeably more attractive effects. The best way to develop proficiency building flicker effects is to play and experiment. It certainly helps to understand what each of the controls is actually doing, so try playing with individual controls first, and then simple combinations of just two controls. Once you have an understanding of how various controls influence one another, you can start to build more complex effects that use many or all of the control channels. Keep in mind, of course, that effect controls are somewhat like colors – it’s often best if you don’t use all of them all the time. The final level of control is from your DMX console. Because you can vary all the control channels continuously, in real time, you don’t need to find single flicker effect settings and hold them. You can use your console to cross-fade between effects, or manipulate them with an additional layer of dynamic control. When setting up an RC4 Flkr Engine, two DMX channels must be assigned: the Master Fader Channel, and the Controls Start Channel. The Master Fader is any single channel. The Controls Start Channel is the first of a contiguous series of several DMX channels. Nothing in the flicker engine prevents you from setting the Master Fader in the same range as the control channels. Nonetheless, it is best to avoid this overlap – keep them separate! With all that’s going on inside RC4 Series 3 dimmers – wired and wireless DMX data, the RC4 Flkr Engine™, the HSL color controller – a means of routing signals from place to place is needed. RC4 HotPatch™ is the answer. In the default mode, dimmers are directly controlled by the DMX channels they are assigned to. The RC4 Flkr Engine™ and HSL color controller are bypassed and ignored. From there, RC4 HotPatch™ provides eight other dimmer configurations as starting points. When using RC4Magic Series 3 dimmers, RC4MagicPC allows these configurations to be further customized by individually routing dimmers to particular data sources. The ability to patch and route RC4 Series 3 features and functions is remarkably powerful. For example, one of the available configurations routes the output of the RC4 Flkr Engine™ to the input of the HSL color controller, and HSL then drives dimmer levels. This allows the Flkr Engine to modulate Hue, Saturation, and Level, rather than directly modulating dimmers, creating a markedly different range of looks than is produced when the Flkr Engine directly drives the dimmers. 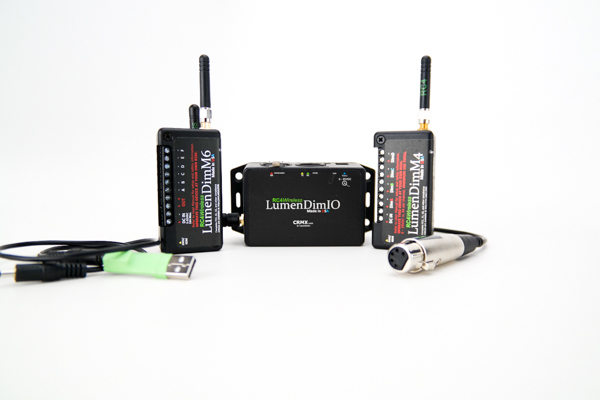 RC4 LumenDim devices provide full wireless RDM support using Lumen Radio CRMX. If you need wireless RDM, use RC4 LumenDim wireless dimmers with a Lumen Radio wireless DMX system. 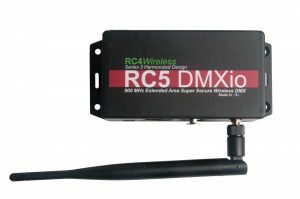 RC4 W-DIM devices are normally delivered without wireless RDM support. 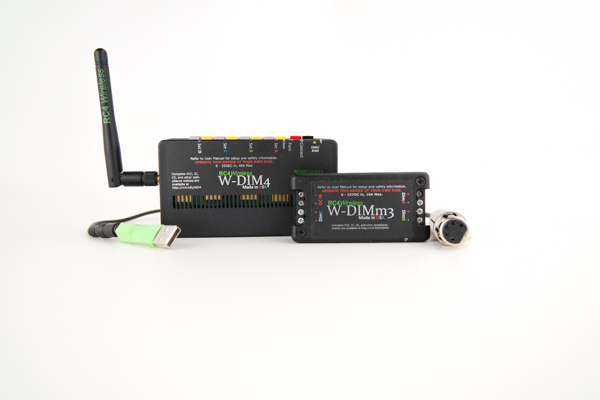 Contact Wireless Solution and RC4 Wireless for further information about wireless RDM with W-DMX systems. RC4Magic systems do not provide wireless RDM. Extensive wired RDM functionality is provided. All RC4 Series 3 dimmers provide extensive RDM (remote device management) functionality, an important part of RC4 Series 3 Harmonized Design. This RDM implementation consists of a Root Device and multiple Sub-devices as defined in the RDM specification. The RC4 Series 3 Root Device encapsulates various sensors built into every Series 3 device for measuring and reporting power supply voltage, internal temperature, and total load current as the sum of all individual dimmer load currents. Each dimmer within an RC4 Series 3 device appears as an RDM sub-device. Thus, devices with 2 dimmers are 2 sub-devices, 3 dimmers are 3 sub-devices, and 4 dimmers are 4 sub-devices. Each sub-device supports RDM configuration of various dimmer parameters, including DMX channel, dimmer curve, PWM frequency, and RC4 Digital Persistence response time. For high-power Series 3 devices with individual load current monitoring for each dimmer, each sub-device also serves data for one individual load current sensor. * Subdevice sensor PIDs are supported only on devices with individual load current sensing. 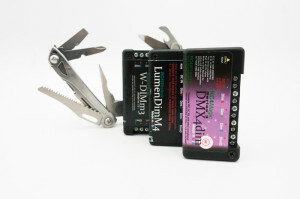 These devices include the RC4Magic DMX4dim-500, LumenDim4, and W-DIM4. RC4 Series 3 Harmonized Design started with development of the RC4 Series 3 CodeLoader. Before any complex system code and functionality was created, we ensured that updates and custom features could always be installed with ease by users in the field. The RC4 CodeLoader is resident in every RC4 Series 3 device and is carefully protected. RC4 firmware files are encrypted before release and decrypted by the CodeLoader, inside the device. The RC4 CodeLoader also guards the device’s unique serial number and RDM address. (Every RDM device in the world must have its own unique address.) Updating firmware in your RC4 Series 3 device will never corrupt this important device-specific information. The RC4 CodeLoader facilitates firmware updating without corrupting user settings and configurations, provided the new firmware does not substantially change the range of available settings and their ranges (major version updates may require loading factory default settings). In most cases, a firmware maintenance release can be installed without affecting DMX channels, curves, and other application-specific settings. Connection to a host PC for CodeLoading is done with an RC4 Series 3 USB CodeLoader Cable. One end plugs into the DMX miniplug port on the Series 3 device, the other end plugs into a USB port on the PC. The RC4 CodeLoader application runs natively in Microsoft Windows and is fully tested for all versions from WinXP to Win10. With appropriate libraries it can also run on Apple Mac OSX, and most flavors of Linux. All you need is a working PC, the CodeLoader app, an Internet connection (to retrieve new RC4 code files), a USB port, and the RC4 CodeLoader Cable. See the RC4 Series 3 USB CodeLoader Cable product page to download CodeLoader software for PC and Mac. Did you catch that mention of updates or custom features? Because the RC4 CodeLoader makes firmware updates easy, RC4 Wireless can easily deliver customized code to solve unique problems. We email you the firmware file, you install it with the RC4 CodeLoader, and you’re up and running. No need for physical shipping of a new or updated device. For example, we don’t have standard code for running a stepper motor with an RC4 Series 3 dimmer, but it could easily be done using a 4-channel dimmer. Each dimmer would drive one of the four windings in a typical stepper. The high-resolution of our dimmers even supports micro-stepping for outstanding positional accuracy! RC4 Wireless DMX and Dimming has been expertly and positively reviewed many times. Not all reviews are available online, and some require reader registration for access. All publishers listed here are reputable industry journals. It is the opinion of RC4 Wireless staff and management that your private and personal information, including your email address, are safe with these companies.